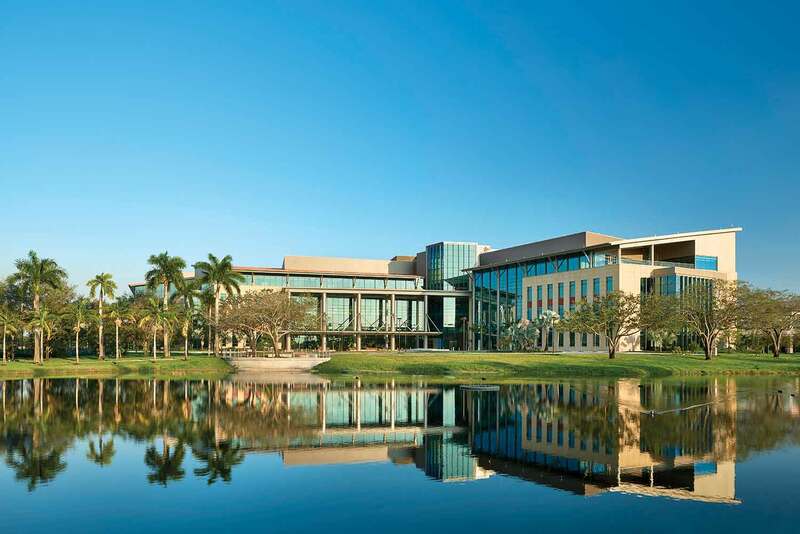 A year has passed since the Miami Cancer Institute opened at Baptist Health South Florida, and it is making progress with clinical trials, officially starting four weeks ago. Currently 55 trials are ongoing and the institute is looking to expand. Helping achieve those goals is Memorial Sloan Kettering Cancer Center in New York. Both institutions reap mutual benefits from their partnership. January marked not only the one-year anniversary of Miami Cancer Institute opening, but also becoming a member at the Memorial Sloan Kettering Cancer Alliance, a relationship that includes sharing research trends on oncology, patient care standards, shared trials and keeping each other up to date on the latest innovations. Dr. Michael Zinner, founding CEO and executive medical director of Miami Cancer Institute, credited Memorial Sloan Kettering Cancer Center, which currently has more than 530 trials, for helping expedite trials here and providing further assistance when needed, including sending tissue sample up to the institute’s Manhattan partner for further analysis, patient access and having its partners design the application of the trial. An example is Memorial Sloan Kettering helping start up the bone marrow transplant program here, which will start in several weeks. The two institutes also provide each other access to a larger, more diverse patient base that they would not find in their respective cities. Through this partnership, Dr. Zinner hopes to expand the trials. Memorial Sloan Kettering Cancer Center, whose main campus is in Manhattan, is considered a world leader in oncology care with “excellent” patient care, standards that have been integrated and adopted by Miami Cancer Institute. Together, both look at their patient base and see the most unmet needs, and are conducting 13 shared trials together. “We are trying to look for the holes in coverage in patient population. If they don’t have a trial, we want to do it, we want to meet the greatest need,” said Dr. Paul Sabbatini, a gynecologic oncologist and MSK’s deputy physician-in-chief for clinical research. The two are in contact on what trials can be opened in Miami, helping each other with ensuring the drug delivery system, monitoring and investigative review board works. Both also share tumor and blood samples so that it would aid their genetics investigation in identifying whether some drugs affect some communities differently. Many of their interactions have been through virtual contact, eliminating the issue of distance. Dr. Sabbatini said they held a lot of virtual conferences and lecture series together to share the standard of care for different types of cancer. Both have also sent physicians to be primary investigators to each other’s cities. It is Dr. Zinner’s hope that Miami Cancer Institute will hit 100 trials by year’s end. With the partnership, the space at Baptist Health and developing more in-house investigative trials, the aspiration could become a reality.